The weather forecast for today was cold, windy and very wet so I decided to keep myself amused indoors by making some homemade exfoliating sugar scrub. Oil: you could use olive oil, avocado oil, grapeseed oil, jojoba oil etc. The best type of pots for storing homemade scrubs are brown or blue glass jars as they protect the ingredients (especially essential oils) from sunlight. Also make sure the pot is air tight to help your scrub last as long as possible. Measure out your base ingredients: The easiest way to do this is to use 1 part oil to 3 parts sugar – if you use 2 spoons of oil, add 6 spoons of sugar. This is enough oil to moisten the sugar rather than soak it. Mix to review consistency: Alter the texture to personal preference. I made this particular batch a bit more oily as my skin is very dry at the moment. If your scrub contains too much sugar and not enough oil, it will not stick to your skin properly and fall off in the shower. Don’t be afraid of having something that looks a bit oily because it will stick to your skin better, making it easier to rub on. 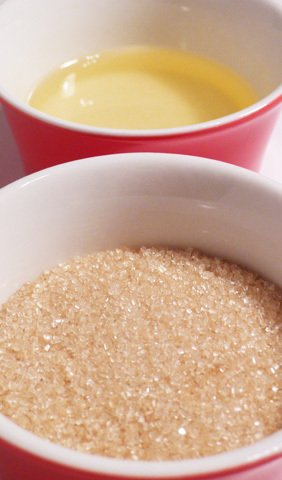 Also, the grains of sugar remove the oil from your skin as you rub which leaves skin smooth rather than greasy. Package it: Once you are happy with the smell and consistency, transfer to a clean, dry, air tight pot. Store your scrub in a cool dark place. And here is my scrub (looks a bit like marmalade)! 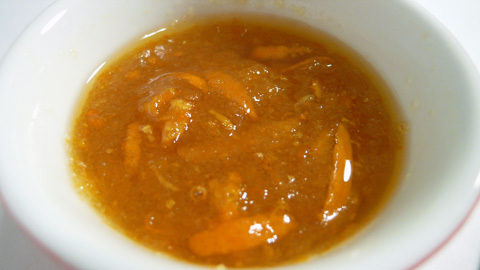 The orange peel gives it a beautiful colour and livens up the texture. This looks wonderful, almost good enough to eat. How long did it keep for? 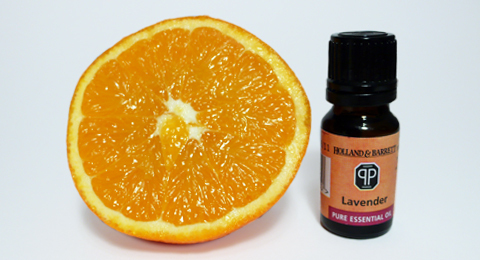 This particular batch will only keep for a few days as I’ve used real orange peel rather than orange essential oil. If wanted to give your scrub a longer ‘shelf life’, you could add rosemary oil extract or grapefruit seed extract. I am making jars of scrub for a baby shower thank you gift and I have made something similiar before. I want it to last longer and I have read grapfruit seed extract is a good preserver. Do you know how much I need to use for a jar that is about 4-5 ounces? I am making 20 jars and it\’s a bit expensive. What do you think? I’d actually use vitamin C powder – it’s much cheaper than grapefruit seed extract and you can buy it from the supermarket and health food shops. A couple of teaspoons in each jar should do the trick. If you cover your scrub with a bit of oil once it’s in the jar this will also help preserve it longer as it keeps the air out.